This is a wonderful bath salt. 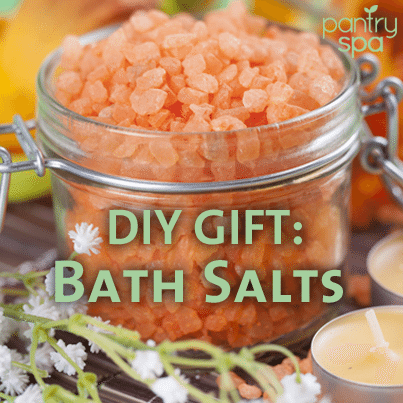 You can drop some in the water and enjoy a hot, relaxing bath. You can use it as a body scrub to get rid of rough, dry skin from your feet, elbows, and hands. You can use it on your legs for a smoother shave. I personally like to take a small amount and rub it on my skin in small, circular motions until the rough skin is smooth. 1. Put espom salt in a large bowl. 2. Drop a few drops of food coloring in bowl. 3. Stir, adding drops of food coloring, until you get the color desired. 4. Add 5 drops or sprays of fragrance and stir. 5. Fill baby food jars with mixture. 6. Put the cap on top. 7. Give it as is or decorate the top of the jar. 8. Tie with a ribbon.